Mr. O’Connor serves on the NSC Investment and Treasury Committee and is a member of the Greenspring Board of Directors and its Community Relations Committee. Roy had a long career with IBM in various Finance and Planning Management positions in New York, New Jersey, and Texas. He later served as Director of IBM Finance and Planning Education in Brussels, Belgium, from 1988-1991, and in a similar position for IBM in Singapore, 1991-1992. After retiring from IBM in 1992, Mr. O’Connor became a Lecturer at the Virginia Military Institute (VMI) in Lexington, Virginia, and taught courses in International Business, Marketing, and Management retiring again in 2001. Mr. O’Connor graduated from the United States Military Academy at West Point in 1960 with a B.S. in Engineering and served as a 1st Lieutenant in the US Army and a Captain in the Reserves. He earned an MBA from the University of Hartford in Connecticut in 1969. Mr. O’Connor served as the President of the Board of United Way of Lexington and Rockbridge County, Virginia, President of the Effinger Ruritan Club, and President of the St. Patrick’s Parish Council, Lexington, Virginia. 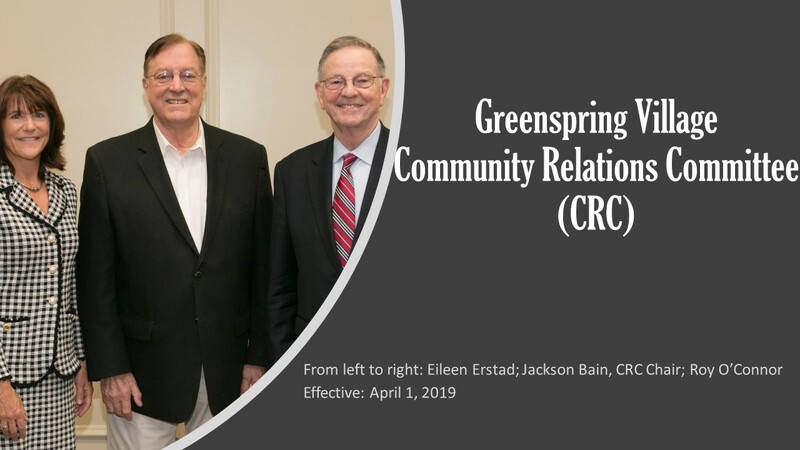 He and his wife, Lynn, moved to Greenspring in 2006 where he served as Vice President and President of the Resident Council.